Align your sales and marketing and you are likely to convert more marketing leads into sales and reduce the cost on new client acquisition. So who is doing this well? The purpose of this article is to find out who you would nominate as the best companies to to this world wide. 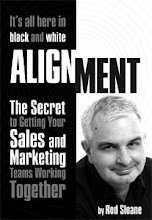 Now thanks to those smart guys at DemandGen Report who hosted the 2009 Sales & Marketing Alignment Awards we already have three. Automation tools are helping Cisco’s call centres prioritise which prospects to target and then improving the results in scheduling qualified appointments for sales partners. Cisco increased appointments with SMB/SME prospects by 25%. Sourcefire created an advanced lead-scoring program. The program allows Sourcefire to evaluate and adjust the quality and quantity of its leads based on feedback from the company’s sales organization. The lead scoring system has been able to show a 25% increase in sales productivity. Employing a new eMail service in late October of 2008 allowed ADX to capture 60 qualified leads for their new service in the first 90 days. Who would you add to this list to make the top ten?